Yesterday I reviewed the new Exhibitionist Mascara by COVERGIRL. I was very happy with that one, but I am even happier with this new mascara. 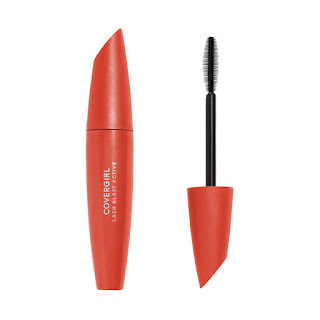 This new COVERGIRL Lash Blast Active Mascara is one of the best new mascaras COVERGIRL has ever put out. It gives you an instant boost of volume along with up to 24 hours of wear in a sweat-proof, smudge-proof and clump-proof formula. Exactly. It's not waterproof but is the next thing to it. It might even be better than waterproof. The brush provides easy application, control and separation of lashes due to the alternating bristle lengths and the brush shape hugs the lash line, helping it to deposit color along the lashes. The mascara has been Ophthalmologically tested and is suitable for contact lens wearers. it comes in four shades: Extreme Black, Black Brown, Very Black and Black. The shade I tried was Very Black. This mascara is easy to apply but is also easy to mess up. It takes 1-2 coats to get the maximum benefits for the best results. I like that it wears up to 24 hours without smudging, coming off with sweat and it doesn't clump at all. It does seem hard for me to get the want (which is a little large) onto my bottom lashes (which are small). The Lash Blast wands are always a little too large for my eyes. Otherwise, though this makes a great mascara and I recommend it. COVERGIRL Lash Blast Active Mascara is available at mass market retailers including Walgreens, CVS, Rite-Aid, Walmart, Target and Ulta. It is also available online at www.ulta.com and www.amazon.com. Like COVERGIRL on Facebook: https://www.facebook.com/covergirl; Follow COVERGIRL on Twitter: @covergirl; Follow COVERGIRL on Pinterest: https://www.pinterest.com/covergirlxo/; Subscribe to COVERGIRL on YouTube: https://www.youtube.com/user/CoverGirl; Follow COVERGIRL on Instagram: https://instagram.com/covergirl/; Follow COVERGIRL on Tumblr: http://covergirl.tumblr.com/; Follow COVERGIRL on Vine: https://vine.co/u/907771872836456448, Follow @COVERGIRLXO on Snapchat and Follow COVERGIRL on Google+: https://plus.google.com/+covergirl/videos.